“World Press Photo 1974” opening. Uploaded on May 4th 2009 by Nederlands Instituut voo Beeld en Geluid. 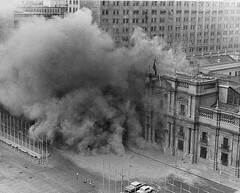 Last Monday 26th, January 2015, was the 41st anniversary of the publication, in the American newspaper The New York Times, of the picture of the only Chilean photographer winner of the prestigious prize World Press Photo of the Year 1973, awarded by the World Press Photo Foundation in the Netherlands. It is the world’s most important prize in Photojournalism. 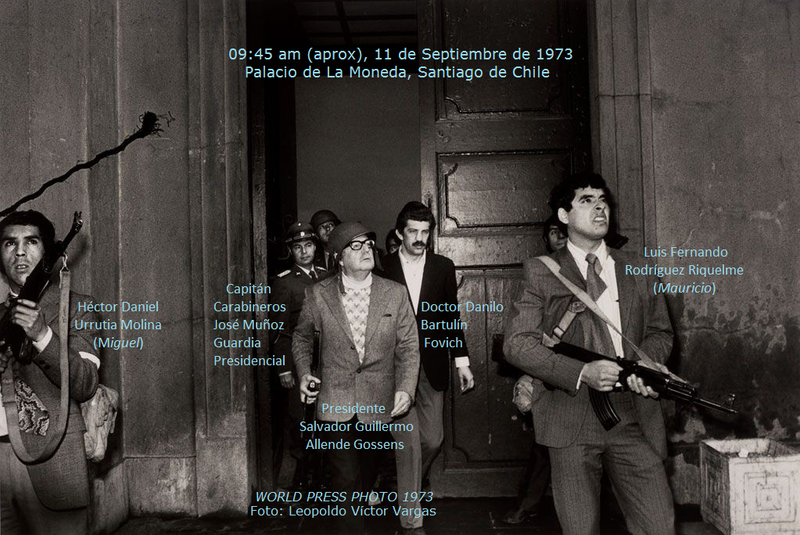 The image shows one of the last photos of Chilean President Dr. Salvador Guillermo Allende Gossens alive, wearing a helmet and rifle on his shoulder, inside the Chilean Palace of Government, La Moneda, the day of the Coup d’état, on September 11, 1973. 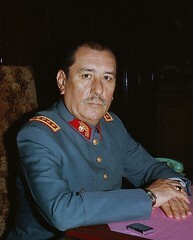 It was taken that fateful morning at about 09:40 a.m. by Leopoldo Víctor Vargas– presidential photographer and non-commission officer (NCO) of the Chilean Air Force. Since it’s publication in The New York Times this picture has become a truly world photo icon. 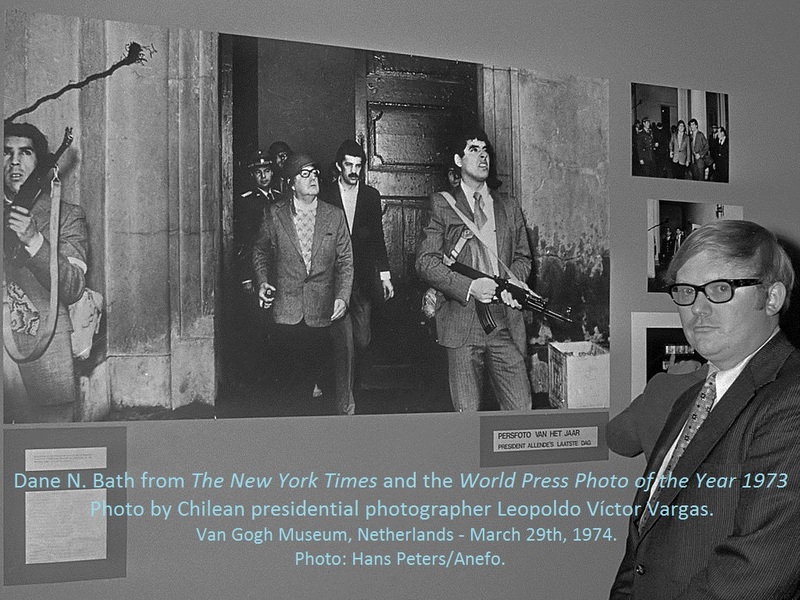 The World Press Photo of the Year 1973 depicts Chilean President, Dr. Salvador Allende, during his tour of inspection through La Moneda Palace of government, looking for the best positions for its defense, while the Coup is in progress. 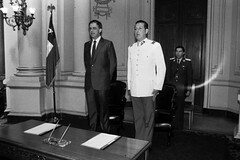 Allende is flanked by two members of his personal guard, known by the acronym GAP, which in Spanish stands for “Group of Personal Friends” of the President. 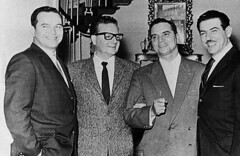 On Allende’s far right is Héctor Daniel Urrutia Molina (a.k.a. Miguel) and to the far left side is, the tallest one, squinting, Luis Fernando Rodríguez Riquelme (a.k.a. 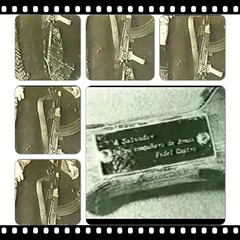 Mauricio). 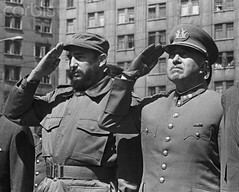 Right behind the President is José Muñoz, Captain of the Carabineros Presidential Guard, and Allende’s friend Dr.Danilo Bartulín Fovich. World Press Photo of the Year 1973 display at the award ceremony in March 29th, 1974.